Some more news: Tippett has announced that Stephan will start in goal tonight and Chris Conner has been recalled from the AHL since they placed Lundy on reserve. Yay Booger! I hope we see Stephan in goal tonight. He should be rewarded for his good play Wednesday, and then Marty could start tomorrow night against Boston. I’d be really surprised to see the game goalie play both those games with the amount of travel between games. Although, knowing Tippett, he’ll probably have one goalie play both games. As usual, Zubie, Lehtinen, and Lundy will be out tonight. The Stars won’t get Zubie back tomorrow night due to weird/stupid NHL rules. Apparently he has to be on LTIR for 24 days, and he can’t play until the 25th day. That means he’ll most likely be back for next Friday’s game against Anaheim. Talk about bad scheduling… no one wants to wait a week between games. My pick to score tonight is Mike Modano because it’s been a few games since he’s scored, and he always seems to play well against the Blackhawks. Hope everyone has a great Halloween topped off with a Stars victory tonight! Heika says that Stephan will be getting the start tonight. I think this is a good move, but I’m a bit surprised that Tippett would actually start Stephan before Marty. He seems too afraid to do anything besides look grouchy behind the bench and randomly change lines around. It’s vital that Stephan gets some experience playing behind these guys in case Marty gets hurt or keeps playing badly. Maybe it was Moog’s influence at practice that got Stephan the start? Otter should be back tonight. At least I hope so because if he’s not, we won’t have enough forwards and defensemen to dress for a full lineup. He did skate on a normal line at practice yesterday, so that’s a good sign that he’ll be back tonight. I hope Otter gets back to feeling great soon because we could really use his energy/pep/irritainment out on the ice. Does Brad Richards still play for us? He’s never mentioned in the pregame show, never seems to do a whole lot on the ice.. I just looked, and he has 6 points but I can’t remember where any of those came from. Must be assists from the night Brunnstrom got his hat trick. Anyway, Richards has been pretty quiet so far this season. It’d be great to see our $8 million dollar man get into the action tonight. That’s why he’s my pick to score tonight… I have to remind myself that he’s on the team. Tippett has pulled one of his favorite coaching “moves” again. Brunnstrom is leading the team in goals, so he’s rewarded for that by being placed on the 4th line. Tippett did the same thing to Hagman at the beginning of last season, and I have yet to find a good reason for him doing something like that. Let’s hope the Stars can pull out a victory tonight. Maybe they will be motivated to play a little better out in front of Stephan since they let him down terribly the last time he got the start in goal. The Stars are playing the Wild tomorrow night, and that will mark the first night this season that we play a team with a player we had last season. Antti Miettinen is leading the Wild with 6 goals so far this season. He and Mikko Koivu are still playing well together – Koivu is leading the league in assists a lot of them have come from Mittens’ goals. They beat Chicago 3-2 last night, and Mittens had a goal and a beautiful assist on another goal. Nik Hagman has been playing well on a Toronto team that hasn’t been playing very well. He had an assist on Super Saturday in the Leafs game against the Senators. There isn’t much to say about Jussi since no one on the Lightning is scoring, but he did finish even after the San Jose game on Saturday. Sarah and I took pictures of all our signs last weekend, and I finally uploaded them all onto our pictures page. Marty showed flashes of playing well last night as his defense and offsense collapsed around him and offered no help. That being sad, he is still playing poorly this season. He goes into these slumps every season, but he has never had to play himself out of one before. Tippett always gave the starts to Hedberg, Tugger, or Smitty for a week or so while Marty would work out his problems in practice. He’d come back in 3 or 4 games and everything would roll along smoothly in net again. That’s not happening this year. I think Tippett expects Marty to play out of his slump, and I’m not sure how well it’s working out for him. Our defense corps has problems. Of our three amazing rookies from last year, one of them is starting with what looks to be a bad sophomore slump. Niskanen has been out on front of Marty for a LOT of the goals scored against us. Tippett seems to have something against Fistric since he’s barely been playing him in games or scratching him so Janik can play. Grossman has been playing well compared to the others, but definitely not at the level we need him to be at. I really don’t think Trevor Daley is very good, and he’s definitely not the second coming of Darryl Sydor like so many people promised. He’s out there with Niskanen for almost all the goals. Boucher has been relatively invisible so far this season, but I give him a bit of a break because he did miss most of last season and training camp so it has to be harder for him to come back. I have nothing but good to say of Robi. Except for taking a few suspect penalties, he’s been our best guy on defense. Our offense has been producing enough goals to win most games, so the biggest problem with our offense is their inability to play defense. I noticed last night how far away most of the forwards were from the defensemen when the Devils were skating the puck into our zone. Most of them forget that they have to actually play defense when they are out on the ice. Our 3 rookies look like they’re having a lot of trouble getting back to play the puck, and a large part of that is that they’re new to the league and will need some time to get used to the system. Brad Richards has been such a disappointment to this team. His defensive skills are severely lacking, and in my dad’s words he thinks “defense is what separates his yard from the neighbor’s”. Sean Avery spends most of his time skating in circles and never really doing anything worthwhile. He doesn’t look anything like a player getting paid $4 million a year. The only forwards I actually skating after the puck into the defensive end are Brenden, Modano, Petersen, and Ott (when he is playing). So that gives us 3-4 forwards who consistently skate for the puck to help support the defensemen. Match that with our young defense corps that’s not playing up to its ability and we have a LOT of problems. This team follows Brenden Morrow, and everyone can see that Morrow is really frustrated on the ice. He takes penalties simply because he’s angry and uses his force to break someone’s stick, knock them over, etc. I know these are stupid penalties, but I can’t help look at him like a silly puppy that does something bad so I have problems being mad at him. He needs to play better though because most members of this team will pick up their play if he picks up his. One thing that has gone relatively unnoticed in this season so far is the resurgence of Mike Modano. The only 2 wins the Stars have come from games he scored at least 1 goal in. He has been flying all over the ice, and it’s so nice to see after watching him the past several seasons. So Stars, the Sign Girls are calling you out. Play better! One last thing: Congrats to Ralph and Razor for winning 2 more Lone Stars Emmys for their amazing job of covering Game 6 of the San Jose series in May. I’m going to try to do one of these each week to keep everyone up to date on what’s going on with some of our former players. First off, Smitty is playing wonderfully for Tampa. He only has one victory, but his GAA is 1.92 (4th in the league) and his save % is .943 (best in the league). He manages to do this with (in my opinion) the worst defense in the league and forwards who aren’t scoring. It’s hard for your stats to be that good, and your record to be as bad as Tampa’s is. 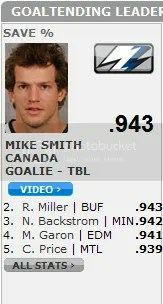 I hope Smitty will continue this play throughout the regular season because he is my favorite goalie (sorry Marty lovers) and he deserves to be successful somewhere. On another note, he cut all his curly off and he looks completely different from the very bushy Smitty we used to know. Antti Miettinen is off to a good start with Minnesota. He has 5 goals, and has been playing really well on the power play with Mikko Koivu. Baby Koivu is one of my favorite Finns, so I’m glad to see they are playing well together. Nik Hagman has been playing well with Toronto, but Toronto needs more help than Haggy can give to them. He only has one goal, but he’s been playing on the power play and penalty kill so his numbers might go up as the season goes on. I still wish we had him back here in Dallas. Jussi has been playing well for Tampa (although not scoring). He has 2 assists and I think he’s one of the few Lightning players who have more than one point. They are really struggling in Tampa. He’s one of the few defensively responsible forwards that Tampa has.